There is nothing more existential, for me, than job-hunting. Hunting for something that will “fund” my real work. Desperately seeking for that which won’t put me on antidepressants, something to keep me alive without killing me at the same time. It’s a funny thing, getting a job that isn’t your “bliss”. What exactly is your bliss? “Writing” is a pretty big category. How many other blisses does it take to make a career? Some lucky people have exactly two forms of bliss. Writing, reading, dancing, singing, drawing, travelling, yoga, running, politics, food resource management, cooking, organic farming, horticulture, physics, genetics, sociology, ecology, social work, medicine, computers, the internet, editing, philosophy, spirituality, research, psychology and teaching. A person is often a writer because she is interested in absolutely everything and to focus on one thing, just to keep herself in e-readers and Iphones, is torturous. Sure a person can do any one thing, but what to choose? Which bliss is the best bliss? Which bliss will make the most use of your talents? Which one won’t make you wonder why you ever got out of bed this morning only to auction off the precious moments of your only life to the highest bidder? I don’t know. But, I believe a symbiotic relationship exists. The thing about the day-job hunt is, it seems like giving up. My adult brain knows better than to think that, but I am not 100% adult yet. I still have a hope for my stories. I still imagine that someone will see value in them and that will make them valuable enough that I could denounce my day job — even if I like it. But, then I think about it this way: maybe the lack of the struggle, that the day job provides, is giving up. To survive is the human experience; it’s humbling and real. It puts you in direct connection with the collective consciousness of the world. We are all in it together — working to create this place to live, striving for more, learning to accept less, and creating things with whatever we’ve got. People get depressed and disconnected when they don’t have a job. We like to work hard to make things happen. We like to make money and take care of ourselves. We despise worrying about bills and debts. We want to experience the world on the world’s level. We are not just observers; we are active participants. We don’t actually want things handed to us on a silver platter. We want to earn everything we get. Our ability and inclination to work is a gift not a grievance. We need to adjust the equation: Work = experience+ challenge/perspective X hope and inspiration to write = Bliss. In light of this new equation, the goal shifts. The goal should be, in my opinion, the bliss of writing the best stories, not to write yourself out of a job. If you’d never had a job, I can’t imagine that anyone would want to listen to you talk or write about life because, what the frack would you know? You can learn so much from any kind of job. 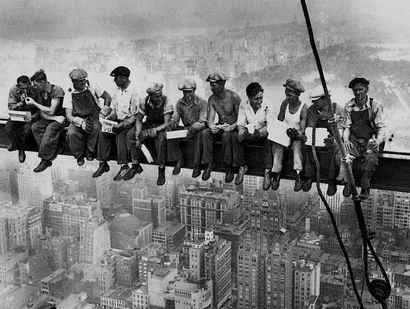 Just think of all the questions you have for those construction workers dangling from the rail, eating their bologna sandwiches. Don’t you kind of wish you’d had that experience? Think of what you could do with that POV. You can’t take it with you when you go, successful writer or not. The thing that counts in the end is, maybe nothing, but probably what you learned while you were here. They say it is better to have loved and lost than to not have loved at all and since you are going to lose something sometime, you might as well believe it. Aside from providing the funds I need to survive, I find that working helps get me outside my head. Most actual writing is an extremely internal experience and it can be a relief to put that behind me and focus on other people’s problems for a few hours. As much as I dream about having unlimited time to practise my craft, I think I’d go nuts if I just sat at home writing all day every day. I feel the same way. When all I have to do for weeks on end is to write, it makes me feel shaky. Like, now this thing is so important and what was my point again? I really enjoyed that – some really good perspective. And yeah – I would love to have a construction worker’s POV. Maybe not for a career, but . . .
Fair enough and wise thinking. There are a great many jobs that I am content to just speculate about.